The pile of Rampagers is nearly complete. Just need to finish the backpacks, highlight the red tabards and fix some of the helmets. Added the decals (water slide transfers), too. Just have to finish the backpacks now. Work continues, while I take a break from batch painting rank and file troops. This time I got stuck into blending blue sections on the armor and cloak. I will start going back and highlighting the metallic areas and finalize the skulls next time. Made some progress on the Thousand Sons backpacks, today, finally finishing off all the raised gold details and shading on these suckers. Just have to go back and highlight them back up now. Nearing completion on the Leviathan. The Storm Cannon is finished. I also finished off the connecting shoulder. I was originally going to make it red, but I opted for the grey, in the, end and I will add some decals. I just have to even out the fur for the other shoulder and finalize the paint on Señor Snippy Claw. Progress on the whole of the first part of the Thousand Sons Tactical Squad, with gold portions done and shaded, now waiting for highlighting. Just need to highlight, go back and clean a few areas on the tabards up then they'll be ready for their boltgun arms. 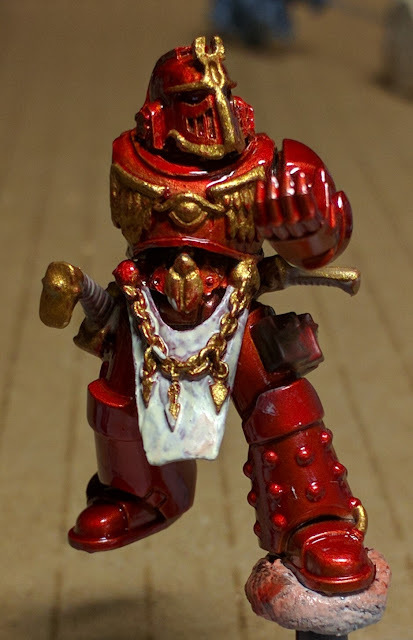 Last time I talked about Khârn I was still procrastinating about what to do about the helmet/head. 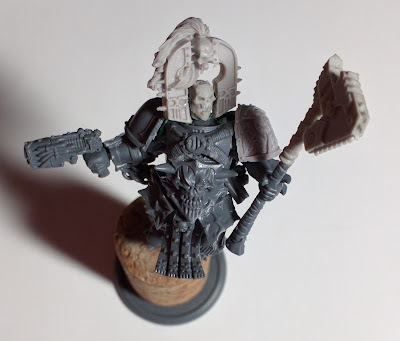 I did get my hands on an Exalted Deathbringer and went to town cutting up and modifying the helmet/head. And I had a little issue. The new head didn't fit on the miniature. So what should I do? We'll I do what all kit-bashers do. 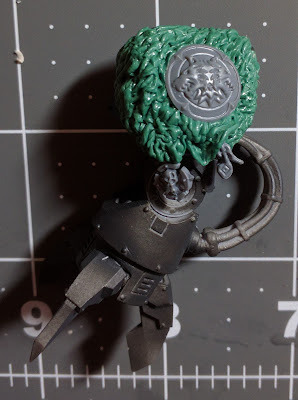 I build a miniature that will fit the new head. And upon completing that, I will have to get back to the quest to finding a good helmet/head for the original Khârn miniature. Work begins on Señor Snippy Claw, this time I started with the blue color graduation on the claws. You can see a bit of speckling from the lighter colours, however I am not overly concerned as it gives the claw more of a feeling that the power is surging to the tips. That being said I will still have to come back in and edge highlight the claw. Just a heads up on my recipe for the blue graduation. 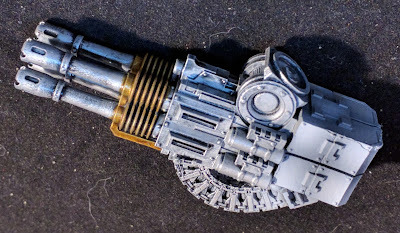 And this is what it looks like on a Dark Angels Power mace. And I also got a chance to start work on the shoulder fur. So when I paint fur I start out with a base of VGA Bonewhite, then I start graduations of Black ink then Sepia ink. Here is how it looks at the first stage. Work on the Leviathan continues. First up, I did a little striping on the knee pad and finished off the basing, for the time being. And finalizing the base. Dry brushing with VGC Pale Grey Blue and a second dry brush of VGC Wolf Grey. And finally adding some Highland Tufts to bring the base into line with the rest of my Vlka Fenryka. Not long now, just have to finish off the actual Leviathan now. 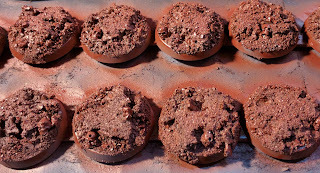 More work on the bases. I changed things up from the original brown scheme, to more of a traditional grey and I finished up the skulls. First up the base coat. 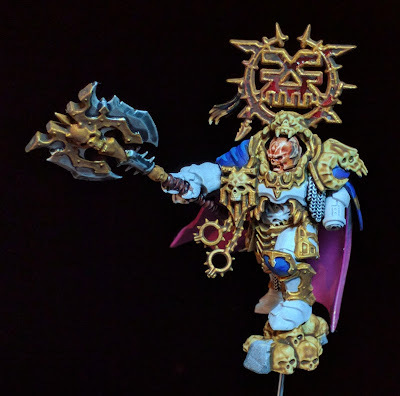 I got a chance to finish a test Thousand Son Tactical Marine. I had to even out the red coat first before I started on blocking in the golds and tabard whites. And with a shade wash of Vallejo Game Ink Sepia. 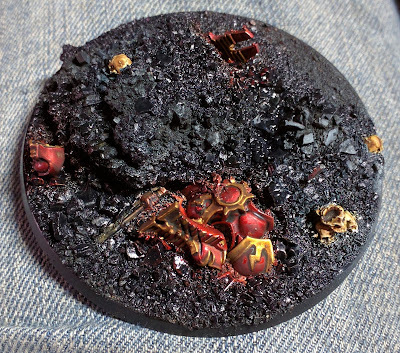 Progress on the base, with me finally working to finish the detailing on the base. And here is how it looks with the Leviathan standing on top. I will still need to go in and highlight the metallic colors and skulls. 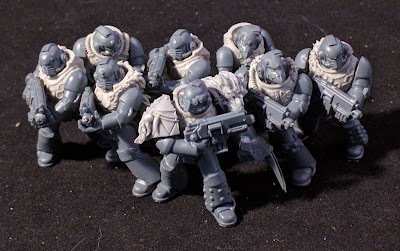 With the release of Spellcrow's Wolves Space Knight Torso and Forgeworld's Space Wolves Upgrade kit, I thought I would quickly throw together another Tactical Squad using these parts. This is how the Spellcrow kit turned out. And I am short a few helmets, in order to make the full 10 man squad. I will use the Forgeworld upgrades to make the final 10 men, and hence, the full 20 man Tactical Squad. More to come, once I finished the Forgeworld final 10. 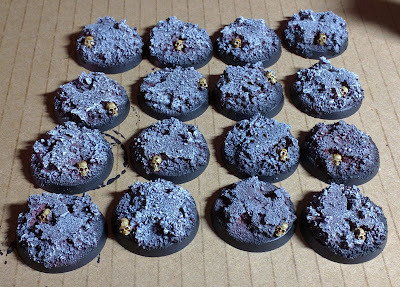 I am trying a different basing color for the World Eaters, to off-set from the white of their armor, differ from the Vlka Fenryka and foreshadow their transition to Khornate warriors. Not sure if I like the way they are going, yet. They are meant to be bloodied mud, maybe from the fields of Istvaan III. It just had to be done. The Leviathan was just not feral enough, so I added some fur to the mix. 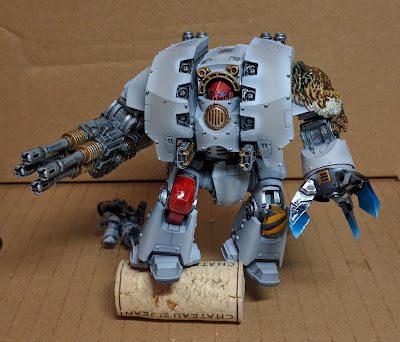 Some of you more eagle eyed punters will notice the shield is from Logan Grimnar's "Santa Sleigh" and there are some off-cuts from the Wolf Guard Terminators set. Once this dries, I will dig into painting and finishing off "Señor Snippy Claw". I must not forget that I have also been working on the various weapon options for the Leviathan. Most importantly, with the new grey colour scheme. So here is some WIP of the progress on the Storm Cannon and Plasma Lance. 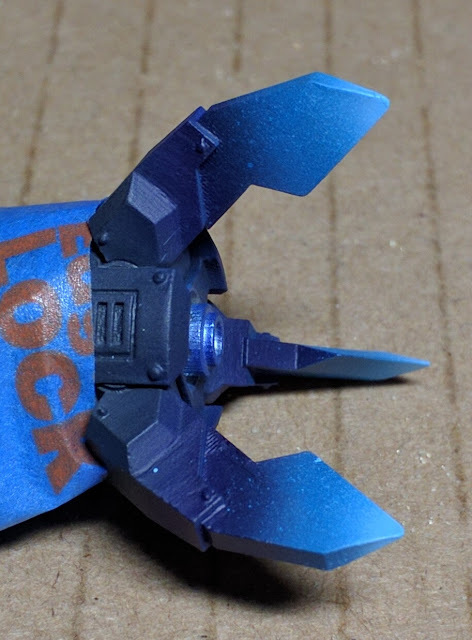 There wasn't a boat load to do for the Storm Cannon, except go back in and repaint the rear section from the 40k blue grey to the more 30k Heresy grey. This is a better shot of the transition highlights on the grey sections on the rear portion. After I finished up the Grey I had to go back in and add the metallic details that had been lost. The Melta Lance was very mush more involved, as it required nearly an entire re-spray. Below is a shot taken whilst I was waiting for the black and sepia washes to dry. I will still have to go back in and highlight all the metallic sections on both these weapons. This should make them pop a little more. And I will also finish off the red power cables, as they are looking a little flat at present. So the question I have for this project is, how do I finish off the decals and squad markings? The shoulder pauldrons are now all ready to go for detailing, but I am trying to work out how to do the markings. 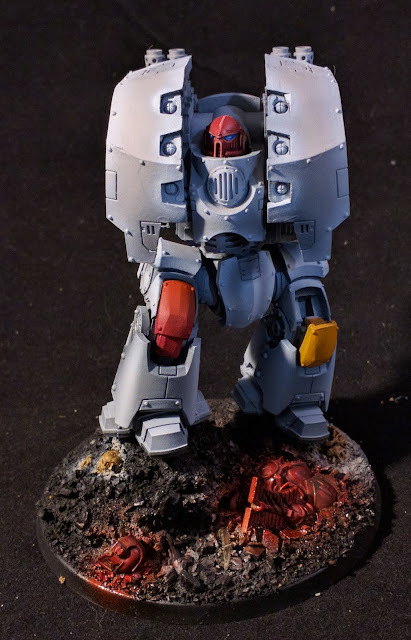 This is a veteran Tactical Marine in MkII armour, with a simple white Tactical Arrow with the legion XII marking underneath on his shoulder. Well first let's look at the new Forgeworld World Eaters Transfer sheet. Perfect. Looking at the sheet, we have medium sized Tactical symbols in red, and both small and medium sized Legion markings XII in red, white and yellow. Sorted. Now to go splurge on Forgeworld ... that Legion Support Cadre would really bulk the army out .. So how did the colors turn out ? I'll let the WIP photos speak for themselves. 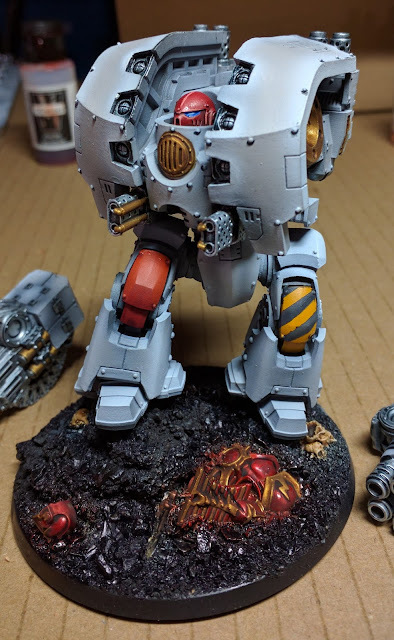 I will admit I was a little heavy handed on the VMC Ghost Grey on the edges, but overall the new scheme works very well, especially so when I come back in and do the obligatory Heresy Weathering. Here I started blocking in the gold and silver sections on the upper carapace. And from the rear three-quarter, so the exhaust and shoulder socket detailing can be seen. Next up shading and ink washing. Off to the spray booth toclear coat and begin oil washing and chipping effects.